Aira praecox (early hairgrass). JC Schou. Foto © Biopix. biopix.nl (Accessed 7/2017). Aira praecox annual grass, 5-20 cm tall, stems tufted. Leaves alternate, blades 0.5–5 cm long, less than 0.05 cm wide, twisted, edges rolled inward, rough-textured ; ligule membranous, 0.2–0.3 cm long (Clayton et al. 2002+). 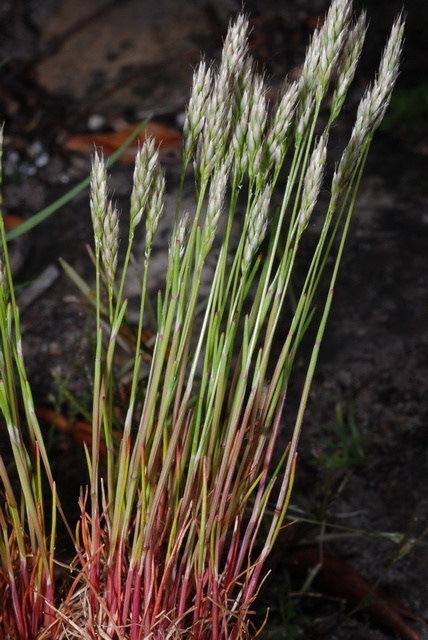 Aira praecox (early hairgrass). © Copyright Malcolm Storey 2011-2117 · 1. Discover life. discoverlife.org (Accessed 7/217). Flower spikelets 2-flowered, yellowish, shiny, stalk shorter than spikelet, glumes about 0.3 cm long, membranous, persistent, lemmas slightly shorter than glumes, tips 2-toothed, both awned from below middle, awn 0.3-0.4 cm; inflorescence spike-like with short appressed branches; blooms and fruits May-June. Habitat: Dry, sandy, open soil.